As I was taking the photos for this recipe, my two year old was peering over my shoulder with great curiosity. In her sweet little voice she started saying, "Eat? Eat?" Of course I had to give her a little taste, which was quickly followed by an enthusiastic, "One more time!" I wrapped up my photo shoot and we sat down to really dig in. Let me tell you, she devoured hers. Lately we've been playing the 'let me throw my dinner on the floor so I can watch Mommy clean it up' game, so tonight made me a very happy woman. 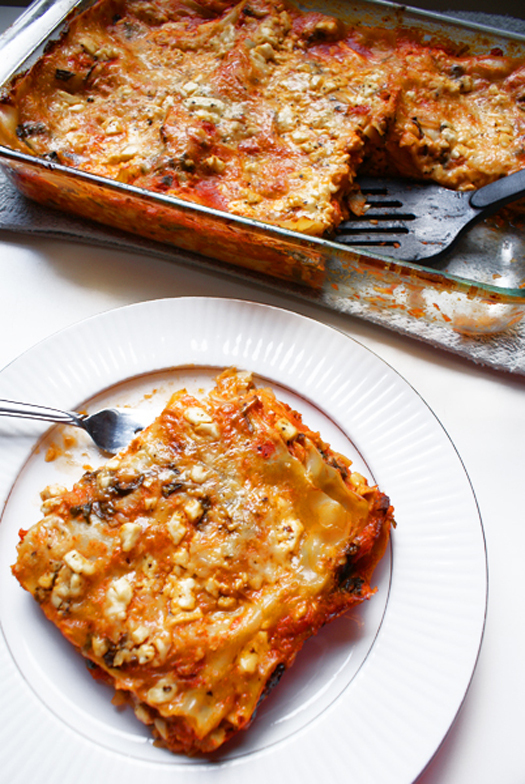 The fact that this lasagna is packed with all kinds of healthy goodness is the icing on the cake. Another added bonus is that it doesn't feel as heavy and rich as your traditional lasagna, which I believe is due to the omission of the ricotta. Topped with garlic herb feta, this one is a unique twist on a classic that you won't soon forget. I hope you enjoy it as much as we do! Heat olive oil in a large frying pan over medium high heat. Add the onions and garlic and saute until softened. Add chopped spinach and continually stir until spinach is wilted. Add the artichokes, rosemary and vegetable broth. Bring to a boil. Stir in spaghetti sauce and simmer uncovered for 5 more minutes. Spread a thin layer of the sauce mixture on the bottom of the baking dish. Top with 3 of the lasagna noodles followed by more of the sauce and a layer of mozzarella cheese. Repeat the layers until all of the ingredients are used, ending with sauce and mozzarella. Top with the crumbled feta. Bake, covered, for 40 minutes. Uncover and bake for 15 more minutes. Let sit for 10 minutes before serving.